I built a Tesla coil once upon a time. I still have it. I was intent on creating (or replicating) the aura photographs of folklore, also known as Kirlian photography. It turns out that Semyon Kirlian was on to something. The phenomenon that he was working with became useful in xerography, more comnonly known as photo copies. In 1943, the Supreme Court of the United States credited Tesla as being the inventor of the radio. Unfortunately, crackpot teachers and text books still credit Marconi with the invention. Tesla died in poverty after giving us the induction motor in our refridgerators, alternating current, and, oh yeah, that annoying morning DJ on our commute. 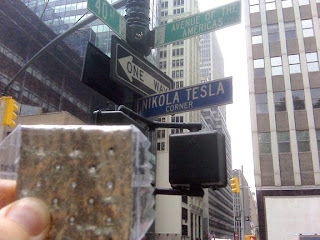 Maybe I'll break out the Tesla coil and create a Kirlian photo of a cracker. As they used to say in the good old radio days, "Stay tuned."